Other people have such beautifully formatted questions and answers, and I have to do it basic HTML. Are there any special keys you have to use in order to have a 'touched up' post? and can someone please show me all the formats? 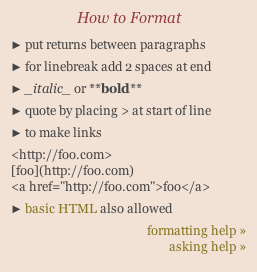 When you ask a question, to the right side of the page there is a block that shows the basic markups to format a page; it contains also a link to the formatting help. In addition to what Kiamlaluno gave you, you must know that this site uses Markdown. Use of > before a paragraph, to make it look like this rectangle I'm writing in. Or [link name](www.example.com) to make links in comments. You'll see its structure and so you'll be able to edit it without making it from the start. Not the answer you're looking for? Browse other questions tagged support formatting . Could somebody fix my question and produce a copy of the answers?